Three DMX512 Universes (1536 channels) combined into one CAT-5 cable. RJ45 connectors used for connection with inexpensive CAT-5 cables. Use as flexible DMX outlet. Mountable with 5mm/0.2” screws or cable-tie. DMXcompander makes it possible to run three DMX512 Universes in one CAT-5 cable. A CAT-5 cable has four data-pairs, one pair is used as the 0V reference and the other three pairs are used for DMX512 Data+ and Data-. 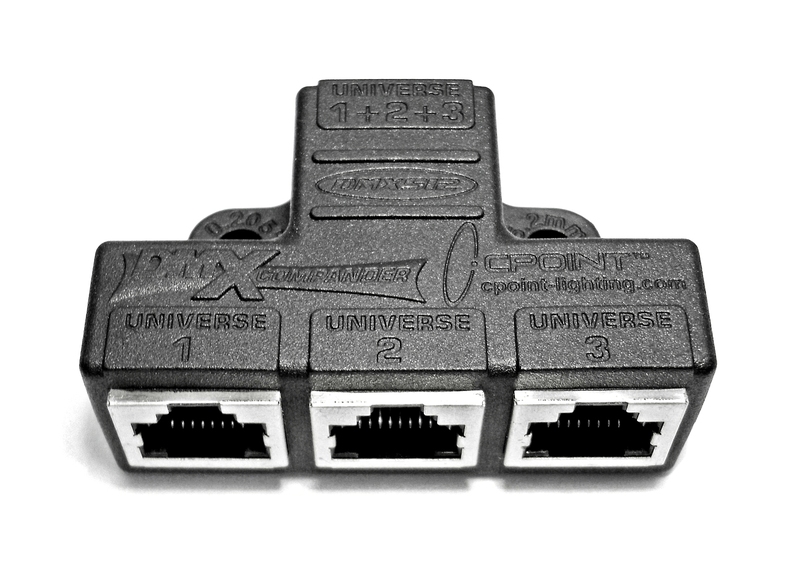 Through the three RJ45 connectors on the DMXcompander, three DMX512 Universes are “COMpressed” into one CAT-5 cable through the ‘Universe 1+2+3’ RJ45 connector. In the other end of the CAT-5 cable another DMXcompander can be used to “exPAND” the DMX512 Universes again, making them available through the three RJ45 connectors. Together with CAT-5 cables and CPOINT’s XLRJ45 adapters, a DMX512 network can be set up very quickly and at a very low cost. The DMXcompander can be mounted in several different ways. Below are some suggestions of how the DMXcompander can be mounted. pin 4 and pin 5, is unspecified by the ESTA Association. It opens up the 3rd Universe to be used for something else other than DMX512, for example power. for all wiring to XLRJ45® connectors. 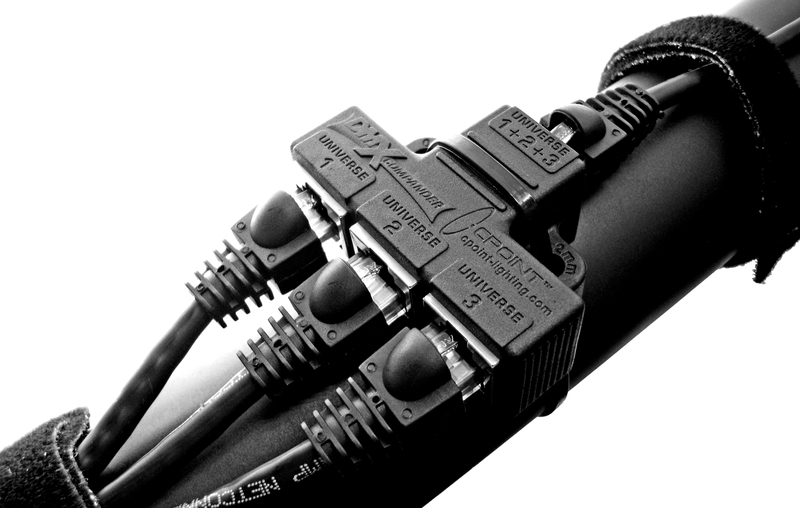 The DMXcompander merges the three DMX512 Universes into one CAT-5 cable. equipment with a RJ45 connector. Use DMXtender to extend a CAT-5 cable, or use the DMXtender as a DMX512 outlet, or inlet. 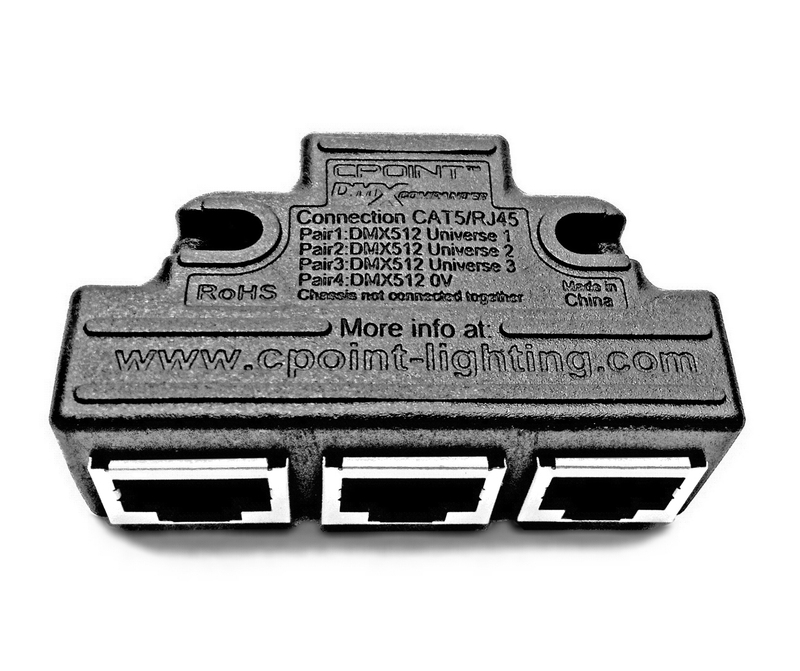 Use CPOINT® XLRJ45® adapters to connect to DMX512 equipment.